Hours: 8 AM – 8 PM MAY 1 THROUGH NOV. 15. 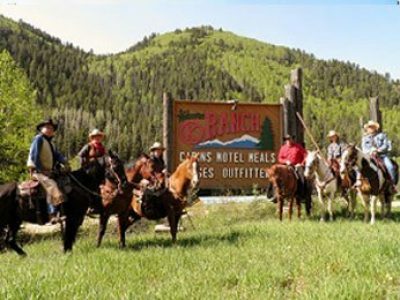 If you are seeking to enjoy a relaxed, peaceful, family friendly and wholesome environment for your next vacation get-a-way, reunion, retreat or hunting trip, Circle K Ranch is the perfect choice. Comfortable lodging awaits you in one of our fully furnished riverside cabins. Circle K Ranch also offers affordable lodging in our motel or lodge units. For youth groups, our bunkhouses offer the kids the camp experience. You have the choice to cook your own meals in a cabin or have our friendly staff serve you some home cooking in our lodge dining room. Getting together with family and friends can be one of life’s most rewarding moments. Meeting rooms are available for your group needs. Elk and Mule Deer Hunting. Challenge yourself and build your team skills through our Low Ropes Course. Exciting float trips through the Dolores Canyon to the Ranch lodge. The Dolores River is right at your doorstep. You may bring your own inner tubes or purchase from us. Volleyball, softball, basketball, table pool, ping pong, camp fire meetings, capture the flag, field games and more!!!!! Options for all ages and tastes. Enjoy the views on one of Colorado’s most breathtaking drives, the Alpine Loop or on one of the many 4×4 Jeep tours available from one of our friends in the town of Telluride. Take a trip back in time as you visit the popular Mesa Verde National Park, the largest archaeological preserve in the United States. Mesa Verde park protects nearly 5,000 known archeological sites, including 600 cliff dwellings. These sites are some of the most notable and best preserved in the United States. Circle K Ranch is a Non Structured Guest Ranch where YOU plan your own individual, family and group activities. Do as much or as little as you would like for a tailor made vacation that suits your style and budget! You may arrive as a stranger, but it is our desire you leave as a friend. We hope to see you in the near future.